Before we begin with this guide to the Dino Preservation and how to beat it, we must mention that this does not work for the live arena or the tournament arena as you cannot return to those battles at a later time if you close the game mid-battle. At the end of the guide we’ve provided some notes explaining important things about this method, but if you correctly follow the steps below walking you through the battle, it will result in victory 99% of the time (at least until it is patched). Pick your dinosaurs and start the battle. The whole battle can be completed with one dinosaur, so ideally you’d want your first pick to be your strongest dinosaur and be sure that it cannot be OHKOed by your opponent’s first creature. Turn 2: Reserve your 2-3 points. 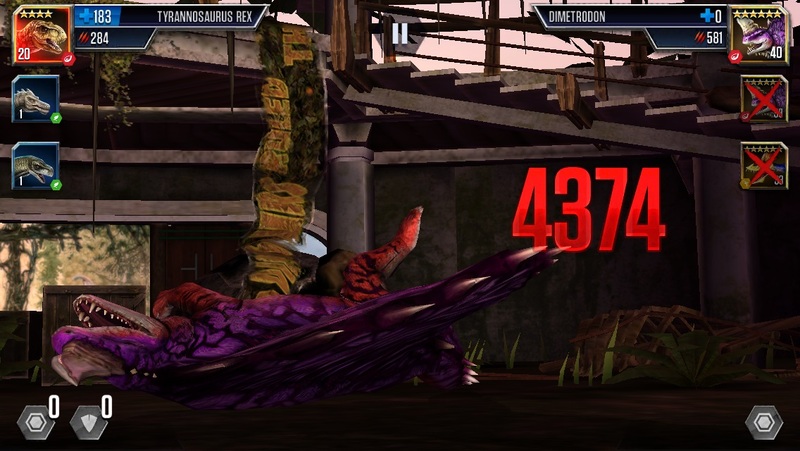 Depending on the dinosaur your opponent has, you may want to use one of your 3 points for block to make sure you survive until turn 3 – It does not matter if they switch to a dinosaur that has type advantage since you will be manipulating the opponent such that they do not attack with enough points for this to matter. Turn 3: Reserve 4, block 1-2. During your opponent’s turn force close Jurassic World either when you see the opponent’s turn notification or during their attack animation. Reopen Jurassic World and return to the battle. If you did it correctly, the AI will attack you with the minimum amount of points necessary to kill your dinosaur and they will use the remainder to defend. Do not panic if/when you see that the AI pierces your defense. This is normal. They will continue to ignore any blocks added beyond the first one until you are one attack point away from death. As soon as you are one attack point away from death, they will no longer pierce through your defense. There is no point blocking with more than one point. 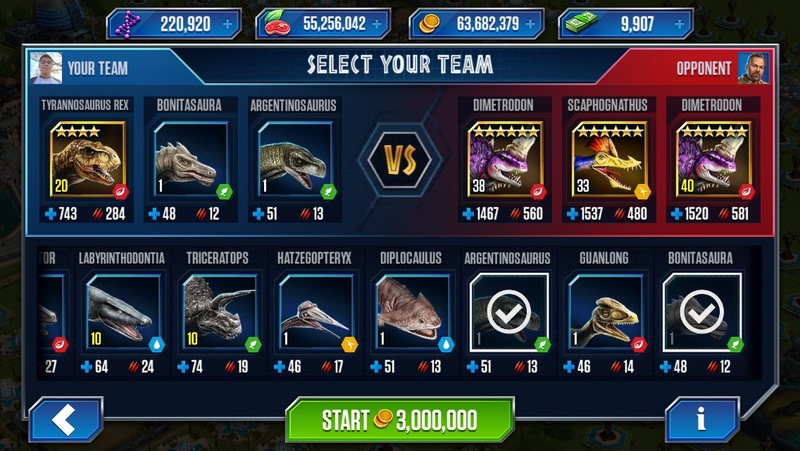 While this method allows you to win the battle with only one dinosaur, you still need to pick a minimum of 2 dinosaurs since the AI follows a different algorithm when it recognizes you are on your last creature. When you reopen the game to pick up where you left off, there is a small chance that the game will say that it will say that the event has expired. Thus, be warned that by using this method you are risking the possibility of your dinos being wasted and having to either buy back your dinos or restart the battle with a different team. To ensure your best chances of avoiding the expired event notification do not click the continue button until the number on the arena icon in the bottom left changes.. The AI has a separate algorithm when it recognizes it has your team completely outmatched, so to ensure your best chances of survival in the first 2 turns, try to pick a team that is relatively equal in strength to the opponent. We play on ios, and force closing as soon as we see the opponent’s turn notification usually works for me. We’ve heard from others that they have to wait a little bit longer to force close in order for it make the AI follow the desired pattern. This trick works for all non live arena/tournament battles. The battle stage infinite AI follows a slightly different algorithm and is often more aggressive during the first 2 turns. For this reason, using one point for block in the second turn is recommended if they switch to a creature that can 2 shot your current dinosaur. Once you reach turn 3 there is nothing to worry about. If using this trick to beat the battle stage infinite, be aware that the algorithm is slightly different from that of the normal event battles. Upon force closing and reopening, they will still follow the rule of attacking with the minimum points to kill, but their defense and reserve point allocations are random. We suspect that Ludia is aware of and working on a fix for this little exploit as when I discovered it, the AI did not have the shield pierce ability. There is an alternative method discovered by someone else that can be used to clear the preservation that follows the same principle of force closing the app, except instead of closing during your opponent’s turn you force close after seeing how many points the opponent defended with. This method, however requires a bit more luck since it does not manipulate the moves of your opponent, but rather it lets you scout and see how many points they put into defense and reserves. If you wanted to, you could combine both methods to slightly speed up the battle. A big thanks to user KeebleTheBeeble for sharing this guide. We hope you like this little trick, enjoy the game and please leave your feedback in the comments. Be the first to comment on "Dino Preservation Guide – Jurassic World"